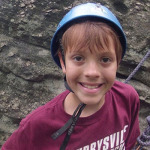 Rock climbing has been a vital part of Jumonville’s summer camp adventure programs for over 40 years. Most of the rock climbing is done at a nearby area called Greenbriar which is just several miles from Jumonville. Older adventure campers have used Seneca Rocks as well as the New River Gorge. In past years we also occasionally used Coopers Rocks in West Virginia. On occasion, we have received requests to have our Jumonville staff take retreat groups on a rock climbing excursion to one of our local climbing sites. If you are interested, contact the Jumonville office for rates so that possible arrangements can be made for your group.